PM, T=75 F, humid, intermittent pitter-patter of rain, with approaching cold front. The night is again full of buzzing june bugs, katydids, and geckos (chuk-chuks). 8:08pm. An owl appeared in the driveway hackberry tree, mid-canopy. Within a half a minute we heard both the M and F trill, though we had pin-pointed only one. The F owl flew from the hackberry farther down the driveway. 8:20pm, male owl flew to the Boy box, entered, and gave a short round of box calls there, oddly, ending in a monotonic trill. 8:21pm, female owl flew back up our driveway to a perch high in the western branches of the hackberry above the shop, not a usual perch. 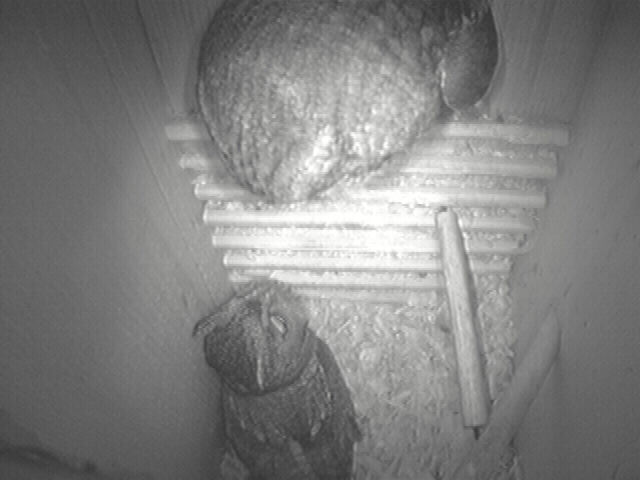 She stayed there for at least 3 minutes, listening while the male owl left the Boy box for the nest box, and gave a bout of box calls and monotonic trills from inside. He left and flew up into the high canopy of the hackberry. So the female entered the nest box, fluffed the shavings on the floor, and exited again, flying east of the shop. Based on the fact that the male keeps advertising the nest box, and the female continues to visit and fluff the shavings, we think it unlikely that they have already nested somewhere else. So the question is: why is nesting so late, compared with previous years? Is it because the male is new and possibly inexperienced? Or that the female is old and more prone to lay infertile eggs, or none at all? Today we spotted an unfamiliar warbler bathing in the water dish on the back deck–looked like a zebra-bird, with black and white stripes on its head, across its eyes, white throat. Tentative i.d. is black-throated grey warbler but for the black patch on its throat. Also saw the hooded warbler again today, our ‘clown bird’. Trees are very leafed out, inchworms and tiny caterpillars dangling. Only have the pecans left bare. 8:17pm. An owl appeared in the driveway hackberry tree, perched about half-way up, over driveway. It sat facing north for 2 minutes before flying N through the Gap. We thought this owl looked small (I guess the male). 8:22pm, male owl flew from the west to our back yard, briefly, then on to nest box. He stuck his head inside and gave one soft bout of box calls, leaving a minute later. On leaving he swooped back over the driveway for an insect catch, and on down the driveway, south. The night air is full of buzzing june bugs and trilling katydids. 8:27pm , the female arriving on external perch of nest box. She gave one soft trill and hopped in, and began to fluff shavings on the floor. She didn’t stay long either; left at 8:28pm and, like the male, went off south down the drive. The owls killed and plucked a cedar waxwing last night. T found feathers in the driveway next morning. Looks like the plucking perch might have been the Honda branch or Boy box perch. 8:05pm, owl flew S through the Gap, landing half-way up in the driveway hackberry; trilled three times from there. 8:10pm, male flew to nest box and entered. We saw the female owl on the Honda branch but did not see her approach, so don’t know exactly what time she showed up. She sat on the Honda branch for a minute or two, appearing to listen to the male’s songs from inside the nest box. Then she swooped east, behind the nest box, and was lost to sight. Male left box about this time, too, reappearing a minute later from over our house, when he landed on the Stub perch. He also dived E over the E’s roof. We didn’t see them anymore after this. Foliage is getting thick enough that we can no longer see silhouettes very easily. C heard a chuck-chuck during the night–nice to know they are waking up again, though it means hot, humid weather in store. AM, T=65, cloudy, dead calm; mild cold front is due to get here mid morning. Male trilling from the driveway at 1:30am, 4:30am. 7:10am, drawn by quiet but insistent sounds of upset birds, I located the M in the crepe myrtle, chittering at his tormentors. But there is also chittering from somewhere up in the hackberry; F is up there somewhere. There were half a dozen jays, silent but swooping close; the M finally spooked and made a dash to the nestbox. As it got lighter, and in spite of the jays still bombing the box, the M made a U-turn out of the box and straight to the Computer oak. He was unsuccessful at escaping notice, though. The jays got tired and went off to bug something else, but their place was taken by a pair of insistent and angry Carolina wrens. That brought a cardinal and a bulbul, plus the hysterical note of a robin. Poor guy; at some point during the next hour he shifted to the denser cover of the cherry laurel across the driveway. Still there at evening owl time. 3:30pm; One low trill from the M, outside the window. 8:03pm, An owl flew south through the Gap, headed for the Prius branch and at 8:05pm a second owl followed. The next minute we heard the distinctive chittering sound which typically follows mating. The owls were in the dark foliage of the cherry laurel. At 8:08pm, one of them flew to the Honda branch, made a slow bug-catching pass over the roof of our house and returned to the area of the Prius branch. Shortly after the male owl flew to nest box, entered, and began a protracted session of box calls and monotonic trills. It didn’t work as well as last night, as the F flew to the Boy box instead and sat in the entrance, apparently listening to the male’s song. After 2 minutes, she flew to the nest box, perched briefly on the external perch, and then flew off towards E’s back yard. Both owls in the driveway tonight; courtship behavior commenced again. June bugs are bumbling and buzzing around in the canopy. T heard cedar waxwings’ thin peeping today, in the upper canopy. That fits with the new leaves and the dangly inchworms, both green and brown, suspended from their invisible silk rappel lines in the driveway. This date is much later than previous year’s nestings. In fact, we are wondering whether our female has chosen another nest site, or whether she might not nest this year at all. PM, stood at the window and watched the driveway for any wings. Saw nothing, not a scrap. No hunting, no trilling, no box advertising. 7:57pm an owl flew diagonally north up our driveway, disappearing east of the shop. A few minutes later, monotonic trills were heard (perhaps from E’s back yard). At 8pm, the female owl flew south through the Gap to Stub perch, and at almost the same time, male flew south from the east side of shop, directly to nest box. We could not hear him inside but are pretty sure he was doing his usual trilling and box calls inside the box. The female flew up to the Honda branch, as if to listen to his songs, but after a couple of minutes she went back to insect-hunting swoops high into the foliage of the hackberry over the driveway. A minute later, she had moved to the Prius branch. So the male left the nest box. 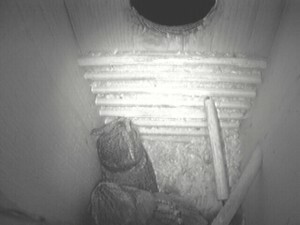 7am, M sat in the nestbox entrance and executed trills and box calls for more than 10 min. Then it got light enough to go off to roost. 8PM, F was in the crepe myrtle; she made a couple of hunting swoops among the mid-canopy for insects, some large enough that she pinned them with her talons to eat. 8:25pm, M came to the box entrance to call; F is in the crepe myrtle. Just before 9:30 the M stopped by to briefly call from the nestbox entrance.